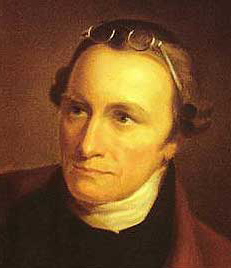 A day like April 15th would have been beyond the Founders’ comprehension. Great pains were taken in constructing the Constitution to strike a balance between the need to fund the government and to protect citizens from overbearing taxation. 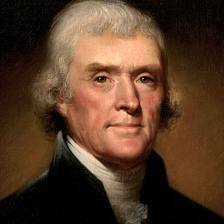 For the first 86 years of the United States there was no income tax. In 1861 to pay for the Civil War Congress enacted the first income tax. It was a flat 3% on incomes over $800. In 1862 the income tax was given a structure that is familiar today: a higher rate of taxation on higher incomes and collection of the tax at the source of earnings. In 1868, something happened that is totally unfamiliar in today’s world. The Civil War was over and the need for government revenues sharply decreased. The Congress, rather than find something else to do with the established revenue stream, abolished the income tax. In 1894 a new flat rate income tax was imposed by the Wilson-Gorman Tariff Act. Elements of the income tax imposed by Wilson-Gorman were direct taxes, and revenues generated from the income from different States were varied. This meant that the income tax revenues were not apportioned equally among the States in relation to their populations. Taxes imposed upon incomes derived from property, real estate or rents were direct taxes. In 1895 the United States Supreme Court, in the case of Pollock v. Farmers’ Loan & Trust Company, ruled that the taxing incomes derived from property or rents was unconstitutional. The Court said those taxes were direct taxes and not apportioned among the States according to population. While Congress retained the power to impose indirect taxes on incomes derived in other ways, particularly labor, the inability to tax income derived from property ownership made taxing other income politically unpopular. Never the less, political proponents of an income tax pushed forward with the slogan that such a tax would “soak the rich”. In the early 20th Century populists of both major parties supported the idea of a tax to “soak the rich”. Multiple attempts to pass laws providing a tax on high incomes were made and failed. 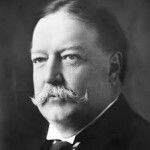 Democrats portrayed Republicans as the “party of the rich” and the tactic forced President William Howard Taft to publicly support the principle of income taxes though he strongly opposed such a tax. Momentum for an income tax increased and in 1909, a bill in Congress was close to passing. Taft and the Republicans devised a political strategy to combat the “party of the rich” label and yet defeat an income tax. On June 16, 1909 Taft sent a message to Congress recommending a constitutional amendment to legalize a federal income tax. The idea was to short-circuit congressional action with a proposal those opposed to the tax believed would never be ratified by the 36 states necessary. However, no politician was positioned to oppose soaking the rich. The proposed Sixteenth Amendment passed the Senate 77-0 and the House 318-14 and sent it to the states on July 12, 1909, less than a month after Taft’s message. Much to the chagrin of those who were opposed to the tax, but had introduced the amendment, Delaware became the 36th state to ratify on February 3, 1913, and the Sixteenth Amendment became part of the Constitution. 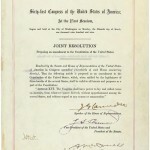 The Sixteenth Amendment took away two prior constitutional distinctions regarding the taxation powers of Congress and income. The direct tax issue was erased and the need to have the tax equal among the States according population was no longer required. The Amendment, submitted through political miscalculation, overruled Pollock and set the stage for making April 15th a date universally disliked by most Americans. While legalizing the income tax was the direct result of the Sixteenth Amendment, perhaps the most devastating effect was impact upon “The right of the people to be secure in their persons, houses, papers, and effects ” guarantee of the Fourth Amendment. 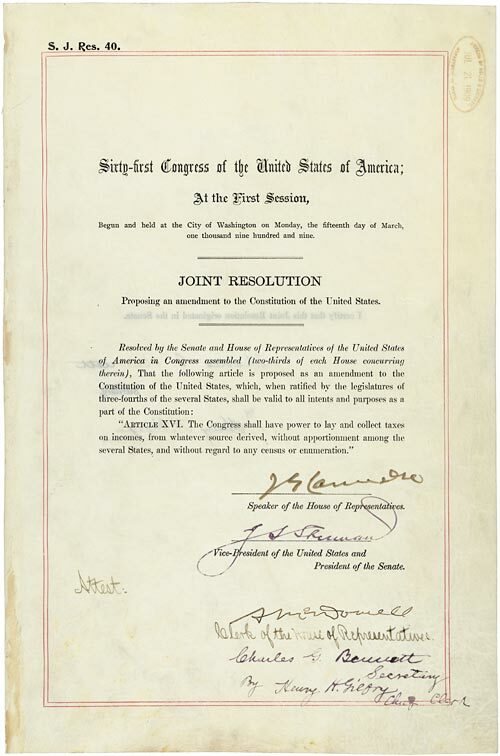 The Sixteenth Amendment was the subject of little congressional debate and submitted to the states with limited consideration based on the belief it would never be ratified. Americans have been suffering the consequences for over 100 years.